I would like to purchase the above product. I first made a purchase at the Herts Garden Show at Knebworth where you had a stand. 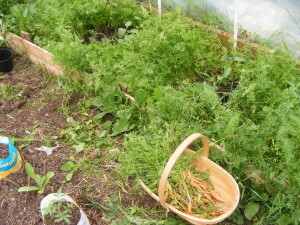 I have used the bag I bought and found it to be very successful in the stopping of slugs and snails. Hey Richard Higgins Yes its been a real journey since the area was layed out with your HH-4!! 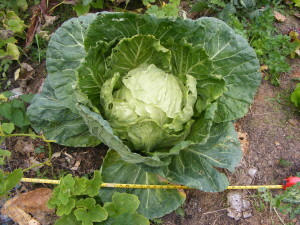 its taken a lot more compost, patience and perseverance! But all worth it! Thank you so much for supporting us with getting the patch started! It has now grown! -into nearly 7 raised beds!! Your expertise and the knowledge you passed on is much appreciated! 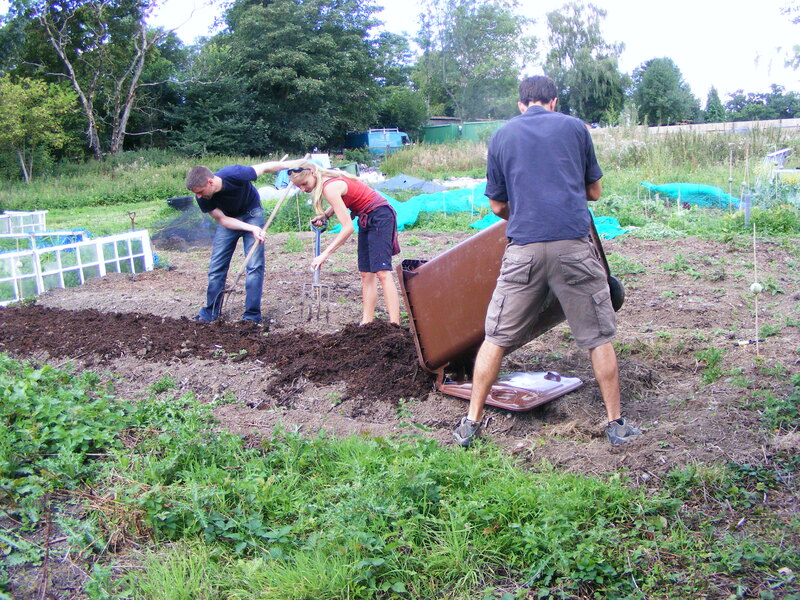 Review by Zahra Anderson, CSA member at the Good Gardeners Well End Micro-farm, Hertfordshire, England. HH-4 fertiliser and soil conditioner ‘compost’ is absolute MAGIC. I wish i had used it from the beginning of the season. But being a cheapskate I tried making my own and buying rotted manure. The slugs ravaged everything i planted. Finally, i went and bought a 20 kilo bag from him for £20. When i go early morning slug hunting now, i find the slugs in some kind of stupor at the boundary of his compost which i have put around each plant. They are not dead, but in some type of comatose stupor….and they haven’t ravaged my plants. When i put them in the bucket to put out in the park, they regain their senses. I don’t know how his compost works….but it really is magic. It prevents all types of disease and parasites from attacking plants. Next year i shall buy a few bags and cover my whole vegetable patch. Richard tells me that if you put it down one year it’s effects last for at least two years. That works out cheaper than buying cheap compost every year. I hope that NGO’s will take up his fertility making methods . He has the key and his mission is simple and effective. His composting methods enable village communities to recycle literally all of their biodegradable waste and turn it into magic compost which produces abundant pest free vegetables, trees and flowers. Unlike the vegetables produced by conventional farming which are saturated with disease-giving pesticides…his vegetables are better than medicine in keeping the body and brain healthy. Modern day agriculture is destroying the soil….Richard Higgins knows how to revive and nourish the soil with the simplest method. His HH-2 system could provide an excellent revenue for anyone who apprenticed under him and learned how to make and sell this compost. Everyone apprenticing under him could be trained how to teach the rest of the world how to revive the soil. Without this type of technology we will very soon see food shortages become a major problem. Learning this technology can safeguard communities from such shortages, and enable us to fulfill our desires for real food security and wholesome healthy living. I am nominating the Good Gardeners community supported agriculture project for the Hertfordshire Rural Living Awards because it is truly astonishing. Richard Higgins has taken the pioneering work of Sir Albert Howard, the Grandfather of organic farming and is accomplishing what UK farming is failing at.. His HH-2 Horticultural system, which can of course be scaled up, works the soil in a truly holistic way that sidesteps the need for vastly expensive ploughing and subsequent tillage treatment. He employs no iol driven machinery and has achieved virtually pest and disease free crops. He has grasped the attention of NorgesVel, CRS., Rothamsted Research, Cranfield and Warwick University. 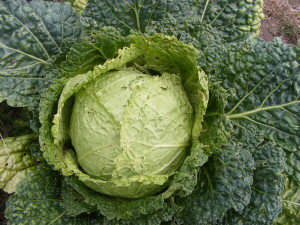 Due to his pioneering work Richard has transformed the soil, previously heavy London clay, into a fertile biomass and somehow there are no slugs , snails or caterpillars in any of his salad crops or brassicas. Thanks for all this update information which I read with much interest. I am enthusiastic about the scientific possibility that your HH-4 compost might be effective against honey fungus and that it might help to save the original Bramley Tree in Southwell— this would be a signal accolade for your compost and capture world wide interest. Two hour presentation of the Howard-Higgins technology to Dept., of Contemporary Agriculture. Attending an ‘Introduction to Permaculture’ day course at Well End with Richard was a crucial event during my search for ‘alternative’ systems. The information about Permaculture Richard had to share with me was very useful. It was not long after attending the introduction course that I enrolled on a full PDC. However, the most important aspect of the day course was seeing Richard’s HH-2 ‘compost Hot Box system’. that can digest all sorts of obnoxious wastes which disappear in 14 days. 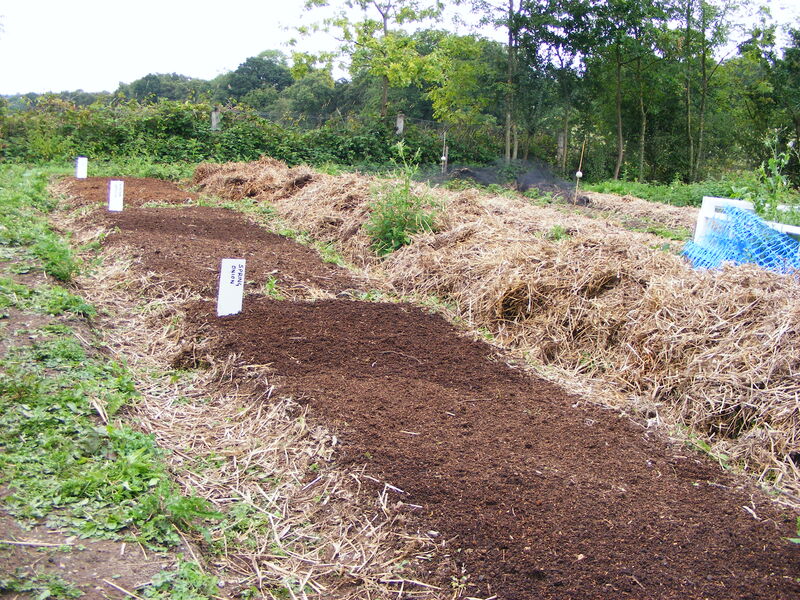 The results spoke for themselves – beautiful compost from which massive, healthy and nutritious food was growing. Here I saw a key design component of what would later become my permaculture homestead in South Africa. The simple toilet system, and the efficient method of including human manure in the composting process via the Howard-Higgins system, HH-2, meant that I could easily manage humanure and safely incorporate it into my gardens. And no-doubt many more reasons, but I’ll stop here! The compost system you taught us is giving the community a lot of joy. We continued producing compost through the whole winter, and have done a lot of work to integrate the compost and dry toilets into the community. Many of our retreatants have had profound experiences while working the compost. This is very valuable to us. First of all, I have to say that I am by no means a soil scientist. I do have an understanding of soils and the soil structures and contents, however have no laboratory experience in this field. My degree was more of a general degree, looking at all aspects of different farming systems in different regions of the world and relationships down such a supply chain, between land, producer, crop, environment and consumer. Therefore, this is the direction that my comments will come from. This HH-2 and HH-4 that you are introducing is brilliant and so needed in a time when large scale farms are still bulldozing away smaller producers with synthetic nutrients, produced via polluting processes. To come up with a product that closes the loop of nutrients and is so remarkably good for health issues (that are ever-common today) is a feat that surely cannot be ignored. – Where do you get / how do you grow your cultured fungi and bacteria? How environmentally friendly is this process? – How long does it take to produce the compost? – Have you actually got empirical and scientific evidence about this food improving health? – You have tried this on clay soil, but have you tried it on further soil types, such as sandy soils and soils where the structure has been completely destroyed, or soils which have been polluted? 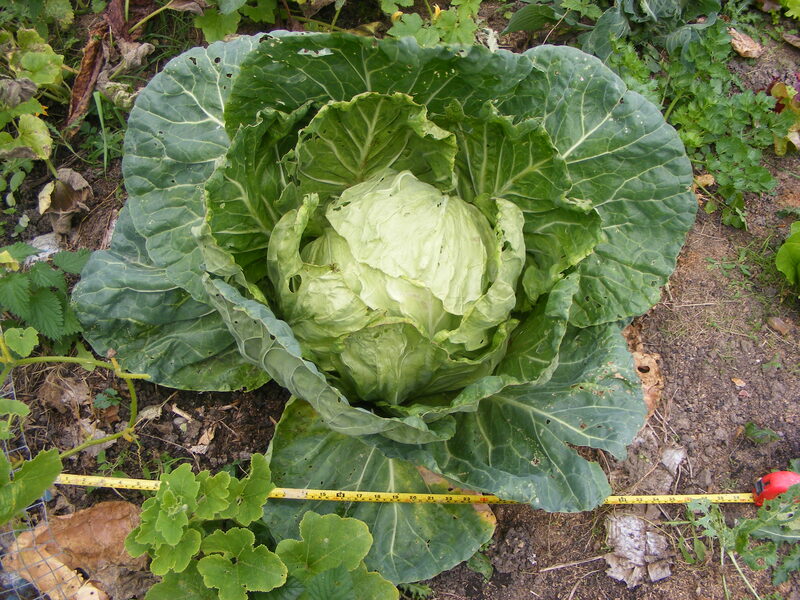 – How much of this compost do you need per square metre / acre and would a, for example, family with a vegetable plot, produce enough green waste to produce enough compost to put on their plot? – What chemical element / compound is your ‘rockdust’ and where does it come from? – as phosphates in fertilizer could also be termed ‘rockdust’ yet that is currently a completely unsustainable product due to extractions rates by far outweighing replacement rates. 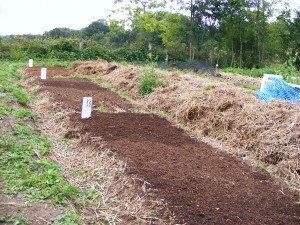 – And so, for application, do you literally place this compost on top of the soil / planted beds? If there was a heavy rainstorm soon after application how would you prevent the compost and nutrients from being washed away? – What is the gas coming off the unit? – is it methane? Can that somehow be recycled? – Is this basically a mini version of an AD plant? 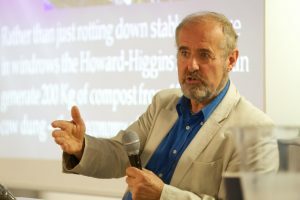 – Have you got empirical evidence for increase in organic matter / soil biota? – What is the anaerobic reaction of the fungi and bacteria? – is it the same fungi and bacteria that you will find / use in Africa? Thank you so much for the course today. Even though we’ve studied a bit of permaculture, there was so much more information in your course about things we’ve never touched on, like alternative pest solutions and food as medicine. The food you grow is so tasty and wholesome! 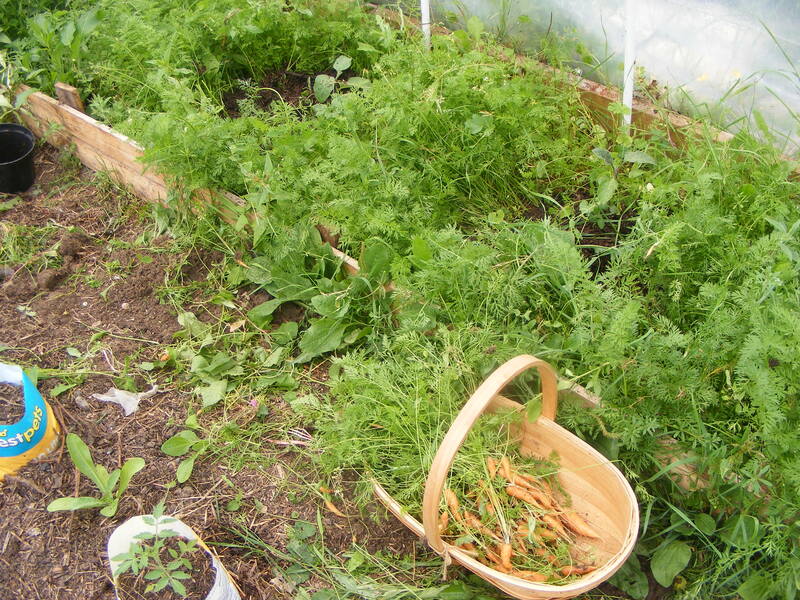 If only everyone knew how easy it is to grow healthy food in abundance. We feel very strongly that with the current worsening agricultural crisis, it is more important than ever that your voice is given a platform to reach the people who need to hear your message. Everyone needs to know this stuff! We came away very inspired to try our hand at these methods and get the word out. By reviving the work of Albert Howard, Richard Higgins is offering a very simple permaculture based compost solution to the impending doom we face in modern agriculture and therefore humanity as a whole! Believe it or not, it’s there right in front of your eyes. 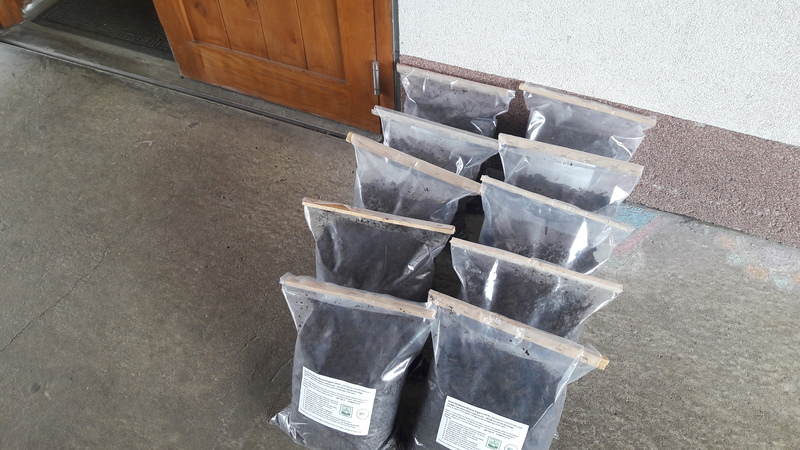 Richard’s micro-farm is full of examples of composted soil vs uncomposted soil and the positive results are clear – bugs and slugs don’t invade healthy crops. 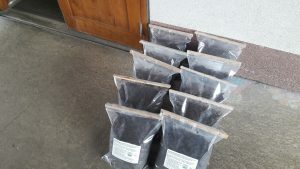 Using just a carefully balanced compost recipe and hot-box process that is now known as the Howard-Higgins system of SuperFast compost, it actually conditions the London clay soil making it not only instantly fertile but pest free and with dramatic health benefits too. Richard even claims to have cured his arthritis by eating his veggies grown with compost and a bit of volcanic rock dust! We’re so grateful for the massive download of information from Richard and his micro-farm tour, and now feel very inspired! Thanks for having me over the other day and showing me around! You have a fantastic place and its great to meet another like-minded composter. I would love to work with your research, esp. with dumping urine onto soil, and would like to know if Rothamsted would be interested as well….. I walked away full of ideas and curiosity. 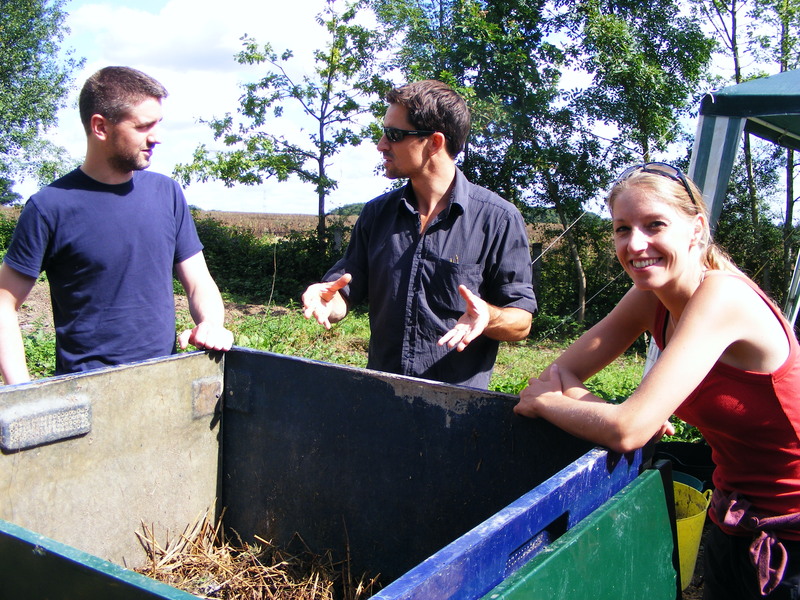 A great introductory course, both the small farm and Richard himself encapsulate perfectly the philosophy behind Permaculture – a movement full of solutions, innovative thinking and hope. The home-made Pizza for lunch was also exceedingly good! I am wondering if you wouldn’t mind me getting in touch once again when I arrive in Italy. I will be working for a renowned cookery school over there, and the Owner wants to re-design systems on the estate (vineyards,cookery school, livestock farms, gardens etc…) to meet Permaculture principles. I think, particularly because Sicily struggles with arid weather, your self condensing composting system (HH-2) would work very well. And perhaps due to the amount of local plant waste they have access to via the farms/gardens, introducing human effluent into he system might be feasible as well. So If I do have any questions when I’m over there or indeed if the proprietor is interested in your work, would you mind me getting in touch please? Thanks for your reply. Sorry I don’t think I explained myself properly. I’ll try again!! In the hot box I am doing NOW I have a LOT of fungus that I can see. Its growing all over the place on the stuff in the box. There’s loads of it! Is that the fungus you mean? Or do you mean a different sort that will only develop over time? Still trying to get my head round it! No, that is the right fungus – you have it! you have the right fungus. inoculate each new Box with fungus from the previous one. to help out one of our volunteers, who brings these to the farm. This is everything in one toilet cassette, no urine separation! By the way – we are using compost in out composting loo now and not sawdust – vast improvement in flies/smell. Thanks Richard. We hope you are well and busy bringing this vital planet-saving knowledge to the world. Email from Carbon Draw solutions Inc., in response to our installation at Plum Village, France. Lovely to see this. Thank you for sharing. I hope you don’t mind if I share this with a few Buddhist friends as well – one in Holland and one in Nepal. This system of recycling human manure is just the best. Spending the day with Richard on his Micro-farm at Well End, was deeply informative and inspiring. We were given a wealth of information throughout the day based on years of experience and decades of research, which for us, who are in the early stages of designing our permaculture small holding, was a gift which will save us immense time and energy. Richard is passionate, generous and clear, a great teacher with a desire to share his wealth of experience and knowledge easily and practically. He was able to provide us with many “missing links” as well as radical ideas and ways of doing things that makes absolute sense. He is deeply committed to sustainable agriculture and the results he is getting speak for themselves. We left there feeling enthused, excited and empowered to create and be part of the solution and have already ordered our HH-2 composting system! Vanya, Indigo Brave Land, Newark. Many thanks for the course the other day! I had a great time and have found a source for the right tins at a sailing centre I volunteer for, just have to wait for them to be empty. I found the visit as a whole very inspiring, in fact I’d go so far as to say that it’s given me a renewed enthusiasm for growing things/learning to grow things! The course itself was very clear and I feel confident that I can now make my own rocket-stove with ease. I would love to return and see how this amazing project develops over time. A beautiful place that’s well worth a visit. I told a couple of friends about your project and they’d love to visit sometime, as would I again, so please do let me know if you have any workdays coming up! It was great to have you at the Massive Small Change conference, and it was lovely to meet you and chat. I’d also like to say how impressed the audience was with your presentation – and considering that technology let us down and you gave a presentation without any of the PowerPoint you prepared, this is even more impressive! It would be great to see a bit more of your work and keep in touch about that idea of a visit to your site. Is this something that would be possible? I have copied in a few EWB-UK people, Lincoln (Training), and Ben (Innovation Hub), into this message to maybe start up some conversations on potential future collaborations. I will get you added onto the communications list. We would like to thank you for speaking at the Massive Small Change Conference on Saturday; we were delighted that you could join us and help to make the conference a success. Our delegates who fed back to us commented particularly on speakers, who were interesting, inspiring and a real strong point of the conference. We still have a copy of your presentation, and with your permission would love to put it on the EWB-UK website to further spread the message of massive small change. Please do let us know if you are happy with this. Thank you for helping us make a massive small change. I really enjoyed my one-day introductory course with you. We covered a great deal of information in a short period and I found the composting section particularly fascinating. You can tell that a course has been successful when it whets your appetite to learn more. Having now completed a little additional research, I think I am starting to better understand both the philosophical and the scientific aspects of Permaculture. I thank you for sharing some of your vast knowledge with me and l look forward to attending more workshops with you in the future. Many many thanks for the information, it will help immensely and broaden my knowledge of this fascinating and pioneering project…. South African toilet We are having the housing made from cut boards from local larch as we are in an AONB area and because we have very high winds. Any other equipment needed in terms of whole set up such as agricultural thermometer and moisture gauge, copper tools ect as I have to calculate what is required. Again, we say thank you for such an enlightening course-we came home feeling very optimistic about our future here in creating a self-sustaining eco-system on Anglesey. Thank you very much for a wonderful day yesterday. As I said yesterday, with you will certainly transform the future direction of my life! I am very happy that I did come along after all yesterday. I found, that it is not only seeing what you have done there, but your passion, knowledge and enthusiasm for the lifestyle that you are creating that is tangible and catching! I have been looking at other ways of living for some time. I am delighted that I have come across you! Today was fantastic, I really enjoyed it, so fascinating and inspiring what you have and are doing – and all your knowledge!! Brilliant. The lunch was also delicious, loved the pie! culture, opening our eyes to different, more effective ways of maintaining soil fertility and plant health. experience and the Pizza was awesome. I would certainly encourage anyone to attend any of his courses. What a lovely day I had a couple of days ago, at Richard’s Introduction to Permaculture! Some of the course was conducted in his comfortable home, watching fascinating videos and slideshows about his work in Uganda and Haiti. His passion for his work was infectious and we asked so many questions that his schedule went out the window somewhat! But he managed to keep steering us along, determined that we would not miss out on any of the topics he had decided to teach us. The efficiency of his composting system, and high quality of compost was evident as we walked around his plot of land, marveling at the lack of pests and disease. He overturned many myths as he explained his approach to vegetable culture, opening our eyes to different, more effective ways of maintaining soil fertility and plant health. It was truly a delightful day. Richard is such a relaxed, good-humoured teacher, and I felt privileged to spend a day with such a knowledgeable and experienced permaculture devotee. It was such an inspiring experience and I would certainly encourage anyone to attend any of his courses. You won’t be disappointed! Spencer and Marie did the vegetable growing course at Well End Micro-farm and are from the Derventio Housing Trust where they also have a farm. It was great to see how your beliefs and practices interacted with nature and the earth. fits into the Soil Association and whether the clear benefits of your systems can be used. What you have done for both Ric and myself is give us the reality that we could make a piece of land work for us which is something neither of us really believed before. Thank you so much Richard – you have changed the path of our lives. We will be great supporters of yours and send anybody interested whom we meet your way and we will spread the word at the orphanage in Kenya. I think that people from our kind of world prefer a little more structure in a course but I understand that ‘course’ is along the lines of ‘convergence’ somewhat so it may be necessary for the public to adjust expectations. Hope this feedback is helpful to you. You are a really good speaker. Spencer and Marie did the vegetable growing course at Well End Micro-farm. They have since invited us to do a consultation on their farm. We have taken away the knowledge that you have passed on to us and looking into how this fits into the Soil Association and whether the clear benefits of your systems can be used. Hope this feedback is helpful to you. You are a really good speaker but I think you know that already. forward by Dr. Elaine Ingram, of Rodale Institute who I liase with. This book goes into great detail regarding generating fungal teas etc., to suit various crops. We hold this title at £15.95 p&pBy altering the ingredient inputs and the timing schedule for HH -2 we can swing the output to produce a more fungal product rather than a bacterial one depending upon final use intended. We add more sawdust or wood chip, in Spain we used olive pulp. I remember you from the course – was it really so long ago? It’s great to see the work you’re doing. Thanks very much for sending me this. Very interesting. I’ll pass it on. Patrick Whitefield is considered the leading Permaculture teacher of the UK.